Over the weekend, we took the boys to see The Lego Movie. We all loved the fun romp through a world comprised of Lego bricks populated by people who could build anything that they could imagine using only the pieces around them. The villain in the movie is President Business. Without giving too many spoilers, he sees random Lego creations as chaotic and craves the order of following instructions. As President Business strived to enforce order, I realized something. Inside me in a bit of President Business. My boys love Lego sets. 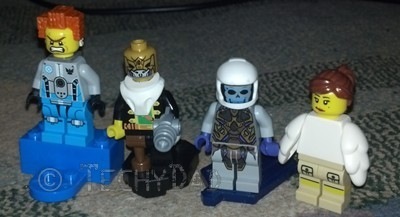 They also love the minifigs that they get with the sets or in blind bags. We can’t pass a display without them begging for just one more figure. 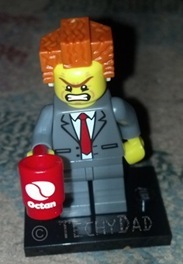 When you get a minifig, they come in pieces and are quickly assembled into the character. However, my boys rarely keep the characters that way. JSL, for example, has lately been combining various Lego minifigures to create "He-Man" Legos (based on the old He-Man cartoons they’ve discovered). While I didn’t discourage them, I admit that deep down I felt that this was wrong. Part of me thought they should keep the figures together "the way they were supposed to be." Watching the movie made me realize that Legos are all about creativity. Yes, there are instructions and building what the instructions say can be fun. However, mixing and matching various pieces and sets to create something new can be wonderful too. You might even say that it is awesome.